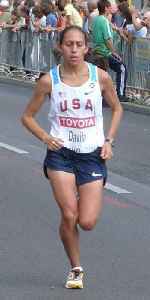 Desiree "Desi" "Des" Nicole Linden is an American long-distance runner. She represented the United States in the 2012 London Olympics and the 2016 Rio de Janeiro Olympics women's marathon. In 2018, she won the Boston Marathon, becoming the first American in 33 years to win the woman's category in the event.